Definitely. Something needs to be done. The building had beautiful architecture , and from my research, no one lifted a finger to fix it, and remodel, and reopen it. It was demolished in 2011. 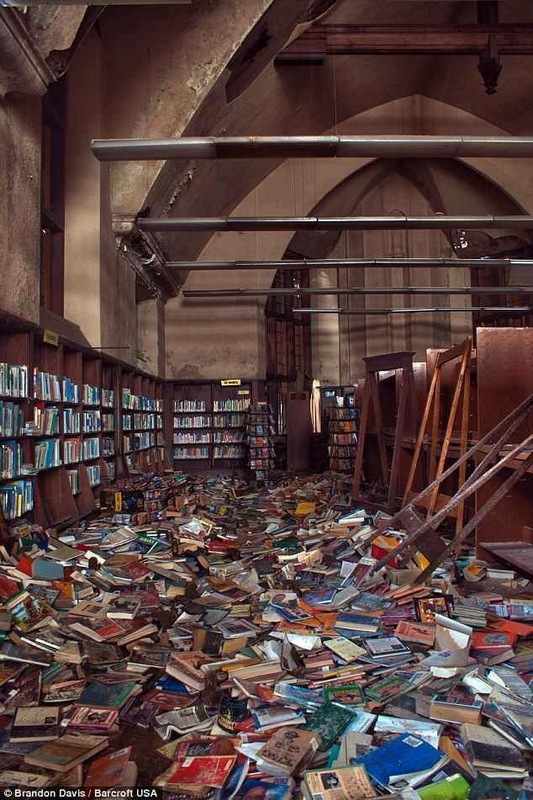 Since the internet has boomed, places like libraries, and others, have disappeared. Replaced by sites all over. But what people have forgotten, is the peace, and solitude that you would get from libraries. The people you would”talk” to, and the conversations you could have. Some day maybe we will be reminded of places like this, and their uses. Maybe when the power goes out. I agree Ken. My city has a mileage vote Tuesday concerning our libraries. If it doesn’t pass, they are going to start closing our libraries. Please send a link on that. What a shame. I had to look it up as someone mentioned it had been demolished. Indeed. A terrible waste for those beautiful books. What a waste! and a distressing sight – so many needy people in my country (and I’m sure in the US too) who would love to read or own those books. It broke my heart to see this! That is really a travesty Angie! Unbelievable! Thanks C. Rae! I found and read this after someone asked about it. I shared it in one of the comments above. I have room for some of those books!